It's the end of an era for Hewlett-Packard, the proto-Silicon Valley software company founded in a Palo Alto garage in 1939. After more than seven decades, HP is splitting into two separate companies, presumably as a way to bolster HP's five-year turn-around plan in the now-congested Silicon Valley marketplace. The software company, known internationally for its personal printers and PCs, has been floundering since the economic crash in 2008, seeing its stock drop over the years as the company struggled to keep up with the smartphones and tablets of the new digital world. According to a statement released by HP, the software giant will split into two publicly-traded companies: one devoted to business software and services, and the other focusing on personal PCs and printers. The personal company will remain HP and retain the famous logo, while the business-oriented company will be called Hewlett-Packard Enterprise. The decision to separate into two market-leading companies underscores our commitment to the turnaround plan. It will provide each new company with the independence, focus, financial resources, and flexibility they need to adapt quickly to market and customer dynamics, while generating long-term value for shareholders. In short, by transitioning now from one HP to two new companies, created out of our successful turnaround efforts, we will be in an even better position to compete in the market, support our customers and partners, and deliver maximum value to our shareholders. The split won't be fully completed until the end of the 2015 fiscal year, but it's already making an impact. According to Ars Technica, an estimated 55,000 employees will be laid off. It will no doubt bring another bleak outlook to HP employees, as more than 30,000 workers were cut from the company over the last year. So, what does the HP split mean for you? Well, you can bet on HP becoming a contender — or at least trying to — in the low-cost tablet world. But don't expect HP to take on Apple as its main competitor. As The Verge reports, HP seems to be aligning itself with Microsoft — another PC giant that had to reinvent itself to match Apple's rising star — and the two companies plan on collaborating on Chromebooks. Just last week, HP launched its $99 7-inch Stream 7 tablet, and plans on releasing Stream laptops in the near future. As a way to stay relevant, HP has also recently partnered with Android on affordable tablets, with the latest one released this week. But it's still unclear whether HP will once again tackle the smartphone game. In 2013, Whitman said consumers should not expect an HP smartphone. However, TechCrunch reported in January 2014 that HP was sending a new, voice-activated, smartphone-tablet hybrid to some international markets. According to the company's statement, what computer shoppers can expect from HP are fuller, more engaging products, as well as advancements in personal printing. Will these new products keep up with ever-changing pace of Silicon Valley? Only time will tell. 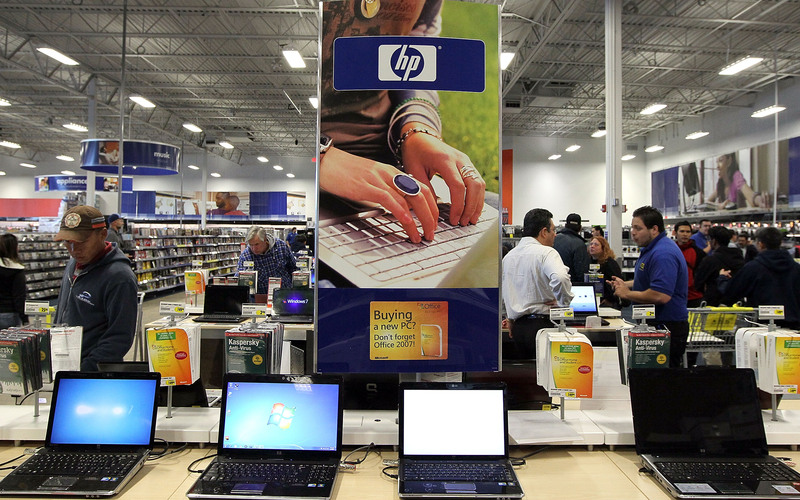 PCs may be out, but it looks like HP is still in — for now.